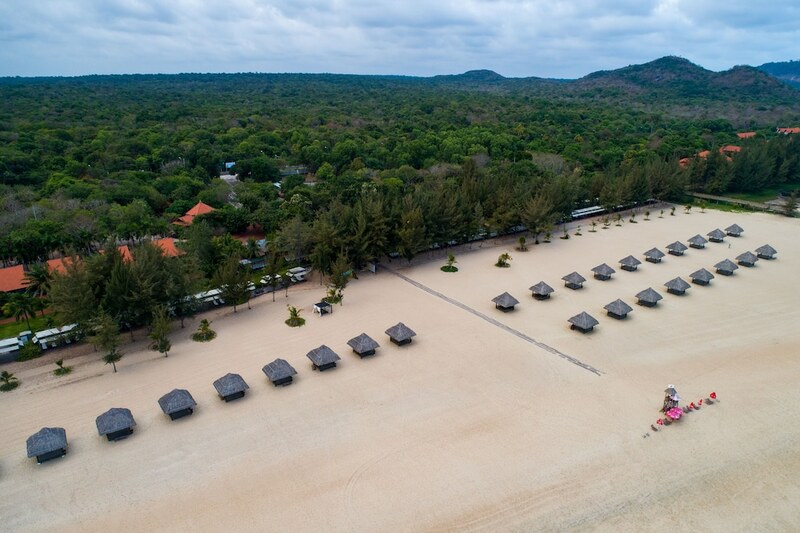 Ho Coc Beach, located north of Ho Tram Hamlet, is home to mostly mid-range and high-end resorts as well as one of the most pristine beaches in Vietnam. Accessible within a three-hour leisurely drive from central Ho Chi Minh City, the beach features five kilometres of white sand where you can enjoy a day of sunbathing, swimming and beach games, as well as sample fresh seafood and local Vietnamese cuisine. Ho Coc Beach is home to beachfront resorts and hotels that cater to just about any budget and preference. If you’re staying at one of the beach’s high-end resorts, the chances are you will also get to enjoy unwinding on a private beach. Sundecks are available for rent for those who aren’t staying at the resorts, and there are some parts of the beach that are still available for public use. It is important to note that the waters at Ho Coc Beach can be too rough or unpredictable to swim depending on the season, so if you’re visiting with weak swimmers, consider checking out Binh Chau Hot Springs instead, which is located 18 kilometres north of the beach. Discovered in 1938, the complex also houses a resort, playground, water park and tennis courts. Water temperatures range between 37°C and 82°C, and its high-mineral content is known to improve health issues, blood circulation and soothe muscle. Visitors can also enjoy mud baths for an additional VND 400,000. Nearby Binh Chau Hot Springs is located in a local town of the same name, where travellers can enjoy a variety of local dishes at Binh Chau Market. Popular Vietnamese cuisine such as Banh mi, chicken rice, pho, and bun thit nuong (noodles topped with grilled pork) cost around VND 20,000 a dish. There are plenty of ways to get to Ho Coc Beach from Ho Chi Minh City, with local buses being the cheapest option. Minibuses depart from Mien Dong Bus Station daily every 15 minutes, with fares priced at VND 80,000. The journey takes about two hours, and you can alight at either Vung Tau or Ba Ria before taking a taxi or xe om (motorcycle taxi) to Ho Coc Beach.